The latest Mk3 Audi TT is packed with technology and has a very sophisticated infotainment system installed as standard (it desperately needs better speakers but that’s another story). But what of the Mk2 TT? Still a great car; but the old Chorus, Concert and RNS-E navigation systems are certainly showing their age. Regardless of whether it is equipped with standard or Bose audio the head unit is the same and is definitely lacking features and performance. One feature that the later cars have is a multi-function steering wheel which incorporates audio controls. These are invaluable as they allow you to alter such things as volume and track without taking your hands off the wheel. When we upgrade the system we would definitely want to retain these. Our most common upgrade to the TT is one the Pioneer multi-media navigation units. These very sophisticated entertainment systems feature DAB radio, CD and DVD, Bluetooth streaming and hands free telephone, Apple Car Play. They also include dual USB ports, reverse camera input and external video input/output. We have all the appropriate installation items required for installation; so that all vehicle functions work properly. This includes steering wheel controls as well as neatly blending with the dashboard. I think you will agree that this upgrade looks great and of course brings a whole suite of desirable features to the car. With the head unit brought up to date it’s time to look at the speakers. Regardless of whether the audio system is base level or has the Bose option; the speakers have pretty much the same disappointing performance. On the positive side the speaker locations are good and the cabin is compact and quiet. The simplest option is to just upgrade the front speakers. There are three speaker locations per side, two in the door and one on the corner dash. If the car is not already equipped with the smaller driver then the ‘grille’ in the middle of the door is actually just a solid cover without a mesh. If we wish to add these drivers then the appropriate part can be sourced from Audi. This then allows us to add a proper three way speaker system, one solution is the Audison Prima APK163. We also like to add sound deadening treatment to the door to improve the acoustic response. The Audi door is well constructed but a generous addition of Dynamat or Skinz will dramatically enhance speaker performance. Another option (and my preferred one) is to ignore the dash tweeter location and install a high quality two way system to the doors. Perhaps the magnificent Hertz Mille Legend MPK1650.3. This is my preferred option as I prefer to keep the speaker count to a minimum. With a three way system there are by necessity two different crossover points; one for the bass / mid and one for the mid / tweeter. More crossover points mean more opportunity for phase errors to creep in if we use the standard passive crossovers with the kit. This can lead to poor definition in the image and sound stage. With a two way speaker system there is only one crossover point that is easier to control and thanks to the good speaker/listening position in the TT the staging works very well. Of course a great speaker requires a great amplifier to achieve the best results. Therefore, the standard Audi (or even the Bose option) amplifiers will never be good enough. One of my favourite options is the Audison Prima 8.9Bit amplifier. This extremely compact amplifier is absolutely perfect. It is small enough to completely hide and is powerful enough to drive all the vehicle speakers. However, if more power is needed then a secondary slave amplifier can be connected alongside. Of course its greatest asset is the very powerful digital signal processor on board. This DSP allows me to carefully tune the system for the optimum sound staging and personal preferences of the customer. It also allows me to customise cross over points, time delay and phasing to ensure the best possible response in the car. Even better, if the TT is a convertible then I can tune two different performances; one for top up and one for top down. These tunings can be swapped at the touch of a button to ensure optimum sound whatever the configuration of the car. Naturally these speaker and amplifier upgrades are not cheap but consider this; if you were to opt for the expensive dealer audio ‘upgrade’ option then when you changed the car you would lose it all and you certainly would not get any of the cost back. In comparison everything I add can be removed and the original equipment reinstalled. This means you keep your investment and can have it reinstalled in your next car (and the next and the next…) and whatever the vehicle I can re-tune it for fabulous performance. I think this makes great sense and offers tremendous value for money. If you would like to know more about how we can improve the system in your Audi TT or indeed any car please feel free to call me on 01625 432707 or better still pop into our shop on Sunderland Street in Macclesfield for a chat. Posted in Car & Home Stereo, Custom Fittings, Sound System and tagged Audio Technician Cheshire, Audiovisual Cheshire, Audiovisual Macclesfield, audison, Bose, Bose SoundTouch, Bose Speakers, Car Audio, Car Audio Cheshire, Car Audio Macclesfield, Car Audio Northwest, Car Audio Technician Manchester, Car Audio Technician Northwest, Car Fitting Macclesfield, Car Sound Engineer Macclesfield, CarAudio Macclesfield, Cheshire, Cheshire Car Sound, Custom Car Cheshire, deadening, Dynamat, Home Sound System Macclesfield, jl audio, Macclesfield, profi speakers, rainbow audio, rainbow speakers, Sound Cheshire Car, Sound engineer cheshire, Sound Engineer Macclesfield, sound fitting car cheshire, Sound fitting car macclesfield, sound proofing, Sound system cheshire, sound system fitting, Sound System Macclesfield, sound technician, speaker, speakers, subwoofer, Subwoofer Macclesfield, Subwoofers Macclesfield, upgrade. 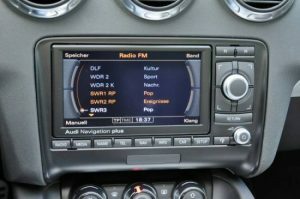 I have an 09 audi TT with the audi concert stereo. I would like to upgrade it to something like the above photo. Would someone be able to get in contact and discuss a job time and quote ? I’m looking to upgrade my Audi Q5 SLine Quattro (2013 model) MMI entertainment system, which has sat nav, parking sensors, Bluetooth telephone and steering wheel controls. To include a rear camera, apple play, Spotify. What are the options and how much would it cost to supply and install? Thanks for getting in touch I will email you directly.